Citation Information: J Clin Invest. 2014;124(6):2736-2749. https://doi.org/10.1172/JCI73072. Patient bone mineral density (BMD) predicts the likelihood of osteoporotic fracture. While substantial progress has been made toward elucidating the genetic determinants of BMD, our understanding of the factors involved remains incomplete. Here, using a systems genetics approach in the mouse, we predicted that bicaudal C homolog 1 (Bicc1), which encodes an RNA-binding protein, is responsible for a BMD quantitative trait locus (QTL) located on murine chromosome 10. Consistent with this prediction, mice heterozygous for a null allele of Bicc1 had low BMD. We used a coexpression network–based approach to determine how Bicc1 influences BMD. Based on this analysis, we inferred that Bicc1 was involved in osteoblast differentiation and that polycystic kidney disease 2 (Pkd2) was a downstream target of Bicc1. Knock down of Bicc1 and Pkd2 impaired osteoblastogenesis, and Bicc1 deficiency–dependent osteoblast defects were rescued by Pkd2 overexpression. Last, in 2 human BMD genome-wide association (GWAS) meta-analyses, we identified SNPs in BICC1 and PKD2 that were associated with BMD. These results, in both mice and humans, identify Bicc1 as a genetic determinant of osteoblastogenesis and BMD and suggest that it does so by regulating Pkd2 transcript levels. 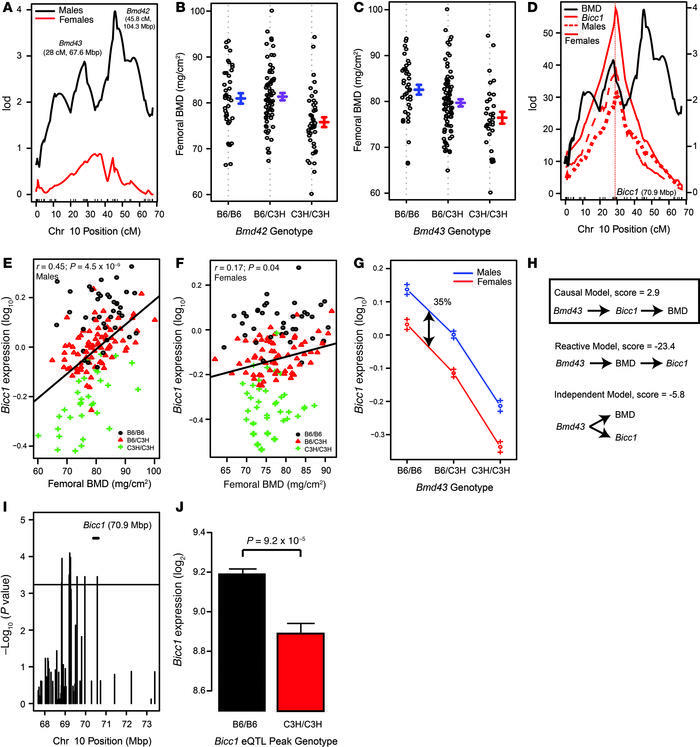 Identification of Bicc1 as the gene most likely responsible for Bmd43. Bmd43 is a novel BMD QTL that is statistically independent of Bmd42 and affects BMD only in F2 males (A). B6 alleles at Bmd42 (B) and Bmd43 (C) increased femoral BMD in male F2 mice. Bicc1 expression in adipose tissue was regulated by a strong local eQTL in both sexes combined (red), in males (short-dashed red line), and in females (long-dashed red line) that was coincident with Bmd43 (black line) (D). Bicc1 expression in adipose tissues from male F2 mice (E), but not from females (F), was positively correlated with femoral BMD. Individual observations are color coded based on Bmd43 genotype (E and F). B6 alleles at the Bicc1 local eQTL increased Bicc1 expression in adipose, and its overall expression was higher in males (G). Causality modeling predicted that the Bicc1 local eQTL regulates BMD (H). SNPs upstream of Bicc1 were associated with its expression in bone in the Hybrid Mouse Diversity Panel (I). As observed in adipose from the BXH cross, HMDP strains homozygous for the B6 allele at the Bicc1 local eQTL demonstrated increased expression of Bicc1 in bone (J). Data presented in G and J are the means ± SEM.